It’s the big battle for London future. No, not the race for the Mayor of London, but between Uber and the Licensed Taxi Drivers Association (LTDA) as they’ve battled out for control of the taxi market in the city. I don’t have a side that I favour in this particular battle (unlike the Mayor of London where I’m firmly on the red side). I appreciate the investment that cab drivers put into learning The Knowledge, but get frustrated that in 2015 you still find cabs that only take cash. Living outside central London I’ve benefited from the flexibility of Uber, but the traditionalist in me doesn’t want to see the end of the iconic Black Cab. But I think the approaches that the two sides have taken provide some insights into what direction campaigning might be going. 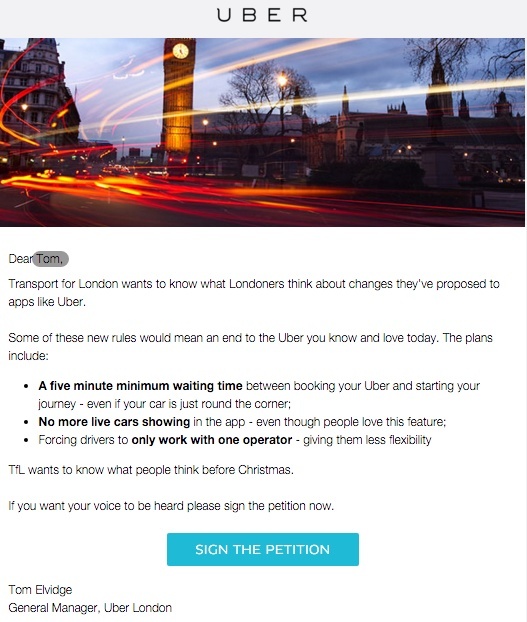 1 – Welcome to “App-tivism” – corporates campaigning isn’t new, of course its been a feature of newspapers to include a cut out petition for years, but the approach that Uber is taking shows a level of sophistication that we’ve not seen before. They don’t simply ask you to sign the petition, they’re employing some of the best campaign strategists to develop campaign approaches you’d expect to see Greenpeace or 38 Degrees invite you to take. In New York they’ve been encouraging users to phone decision makers or take advantage of a “DE BLASIO” (after the New York Mayor) to the menu of ride options seen by its New York City users to see what impact his proposed restrictions might have, while I got the email below after an Uber journey I took last week. As this Harvard Business School article suggests ‘we’re entering a brave new world where the creators of technology platforms can activate billions of users to specific political action of their choosing’. And its not just Uber, this collection shows how Airbnb and others are using the same approach, see more on Apptivists here. 2 – Old power needs to adapt – But Uber doesn’t have it all their own way, the influence of the London cabbie as we head towards Mayoral elections next May, means that they’re powerful. Any aspiring candidate for Mayor of London doesn’t want to get on the wrong side of the cabbies, the seen as as trusted messengers by many. I’ve really enjoyed what Jeremy Heimans has written about old and new power. LTDA are shown that old power can still influence, but how long will that hold? Does LTDA need to adapt and change its approach if it wants to continue to compete with Uber? 3 – Incentives to get you to take action – Unlike most campaigning organisations, Uber has a big advantage to get you to take action, it can provide you with incentives – free journey credit in return for sending an email for example (they’ll already offer to take you to a demonstration for free). Uber’s strategy to dominate the taxi market is well known, so the cost of a few free journeys in return for the market access they want is a minimal cost. Alex Evan’s has reflected elsewhere about the concept of ‘activism air miles’, but if Uber and others start offering ‘free’ incentives in return for your action will it change the way that others have to respond? 4 – Use the Courts – Uber knows that building political pressure is just one tactic it needs to use to win what it wants, which is why its also devoting its resource to winning rulings in the High Court. I’ve reflected before that using legal routes is under utilised in campaigning here in the UK, a few organisations like Client Earth have shown how it can effective can be, but the costs and complexity appear to rule it out for many. With the national political arithmetic unlikely to change in the next few years, exploring new routes like using the courts could be another option for campaigners.